How to download and install BEAST on Mac OS X. This will download a disk image (a ‘.dmg’ file) probably into your Downloads folder. To run BEAST on Mac OS X, you will need to have Java installed. Older versions of Mac OS had Java installed by default but this is no longer the case. BEAST currently requires at least version 6 of Java and this can still be installed as an optional package from Apple. Alternatively, you can install the latest version of Java which is distributed free by Oracle. The former option is easier but the latest Java may give slightly better performance. You can download the ‘legacy’ Java 6 from here: https://support.apple.com/kb/dl1572. This will download an installer which will install Java and you are ready to go (you won’t need to restart the machine). 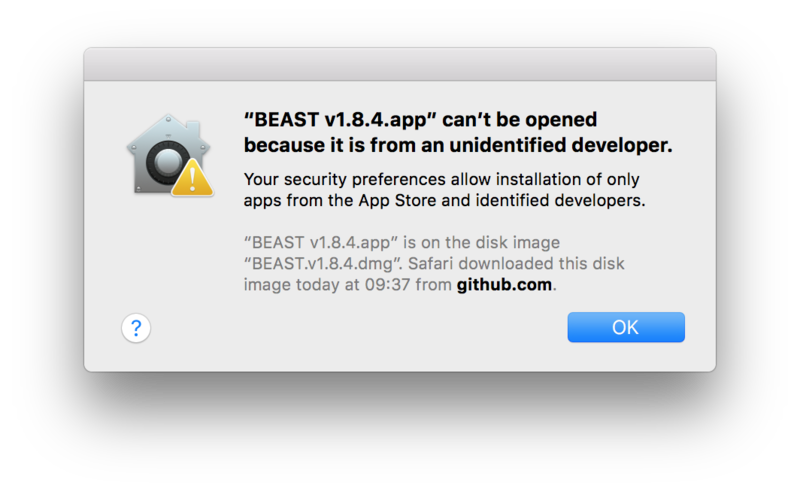 The Mac version of BEAST is not yet compatible with Java 10. Please use Java 8 or 9. Double-clicking the disk image file will open the a virtual ‘disk’ in a Finder window. At this point the applications are still on the ‘disk’ created by the disk image. We suggest that you drag the entire folder into your Applications folder (either the main Applications folder or the one in your user folder). You can drag the folder by clicking, holding and then dragging the little white icon at the top of the disk image finder window. The Mac OS X security dialog. By default it only allows you to run software from developers registered with Apple. For more information about this, click the question mark button. Rather than double-clicking to run the application for the first time, you can control-click (or right-click) on the application icon and select Open. This will bring up a similar dialog box to the one about but this time it will have an Open button which will override the security for this application only. You will only need to do this the first time you open an application but you will need to do it individually for each of the applications in the BEAST package. You can then drag the icons into your Dock if you want quick access to them. We also strongly recommend that you install the BEAGLE library to accelerate BEAST’s computation (indeed some analyses are not possible without BEAGLE). For more information about BEAGLE and information about installing it, see here. Mac OS X is particularly popular in computational biology because it is built upon a UNIX operating system which gives it access to a wide range of scientific software. BEAST can also be installed to run within the command-line environment provided by the Mac OS X Terminal.app. For instructions on installing BEAST for a UNIX command line see this page. The above instructions will also work to install BEAST as a command-line tool in Mac OS X. However, the recommended way of installing BEAST for use in the Mac OS X Terminal is to use the Homebrew package manager. If you use the Mac OS X command-line you are probably familiar with Homebrew. This is a simple and convenient way of installing and updating command-line software on the Mac. Homebrew provides a huge range of science and bioinformatics software and a list of packages can be found here. See the Homebrew website to get it installed.